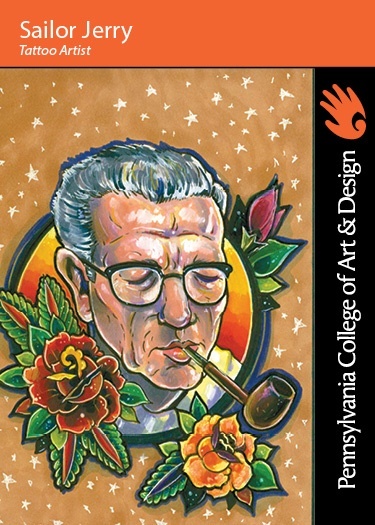 Tattoo artist Norman Collins "Sailor Jerry" was born on January 14, 1911, and grew up in Northern California. He left home as a teenager to seek new and exciting experiences, hopping freight trains across the country. He learned hand tattooing using black ink from an Alaskan named "Big Mike.” While in Chicago in the late 1920s he met Tatts Thomas who taught him how to use a tattoo machine, and he paid Skid Row vagabonds for the opportunity to practice his art. At age 19, Collins enlisted in the United States Navy, and following his service, set up his tattoo shop in the Hotel District of Honolulu, Hawaii. During and following World War II, Honolulu became a hub for thousands of sailors and soldiers on leave, and the Hotel District became known for its bars, brothels and tattoo parlors. He was dedicated to the craft of tattooing. Experimenting with and perfecting, detail by detail, techniques for shading and tone and texture, Sailor Jerry, as Collins was now known, was in a constant quest to deepen his own skills. He expanded the array of colors available by developing his own pigments and he developed a needle technique that caused less trauma to the skin. He was one of the first tattoo artists to advocate for medical-grade sterilization procedures and the use of single use needles. During this time, Sailor Jerry developed his signature style that combined techniques of Asian Art and bold use of color. The most proficient and sophisticated tattoo artists of the times were the Japanese masters known as Horis. Sailor Jerry became the first Westerner to consult with these artists, sharing techniques and tattoo tracings. Sailor Jerry combines American and Asian approaches and created his own style of tattooing. In addition to tattooing, he followed multiple passions. He was captain of a three-mast schooner that gave tours of the Hawaiian Islands. He promoted his political views and read his poetry on his own radio show Old Ironsides on KRTG. He taught himself to be an electrician and innovated his tattoo machines. He even played in a jazz band. A film about his life and art, Hori Smoku, documents his influence and an annual event in Hawaii, the "Sailor Jerry Festival," honors the artist's global influence, his many achievements and his local ties. Sailor Jerry was born by the name of Norman Keith Collins in Reno, Nevada. As a youth Collins travelled the country by hopping on trains from city to city. When he was 19 Sailor Jerry enlisted in the U.S Navy. The art work and style of Southeast Asia he encountered on his travels in the Navy would have a great influence on his tattooing style. Some of his most famous designs include: Roses, snakes, dice, pinup girls, daggers, and skulls.